My modest St. Patrick’s Day plans (which did not involve any of the swamped Irish pubs in the Lower East Side, I’ll point out) were to play Super Scrabble with J and cook an authentic Irish dinner: pan-fried sole, colcannon, tipsy pudding…or maybe just a delicious batch of fish and chips! But after double-featuring it at Angelica with “Tsotsi” and “Duck Season,” we found the market closed, and so revised our evening to homemade pesto pasta (appropriately green, at least) and the more deli-shopping-friendly Irish Soda Bread. I searched online for a recipe and found about a million—some with honey, some with caraway, some with treacle, some white flour, some wheat flour, some with buttermilk, some with yogurt…I settled on the one that I had the most ingredients already in my kitchen for. I’ll admit something embarrassing right now: I’ve never made bread before, really. I say embarrassing because it’s like growing some portion of your own food, or making some of your own clothes—one of those things that prove you could be independent from the world if you wanted to. So this, admittedly, was my first loaf of bread. 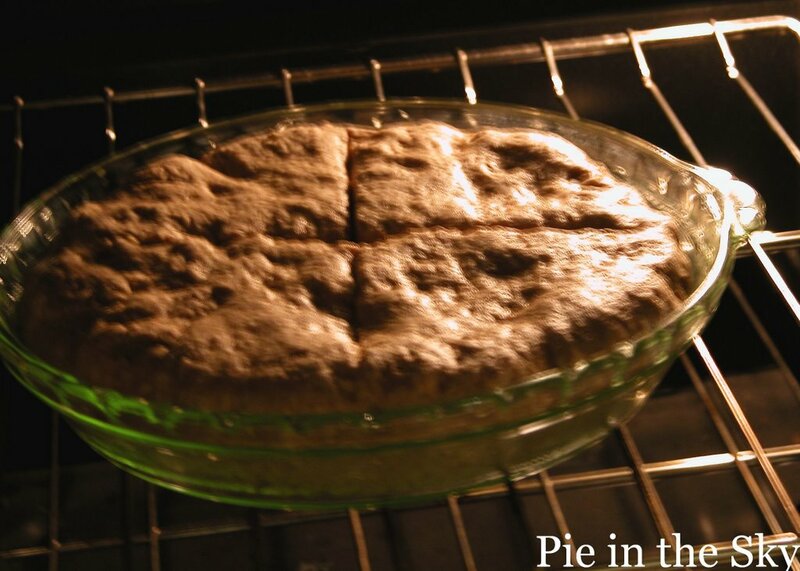 Lightly butter a heavy skillet, casserole, or glass pie dish, 10” in diameter and 2 to 3 inches deep. 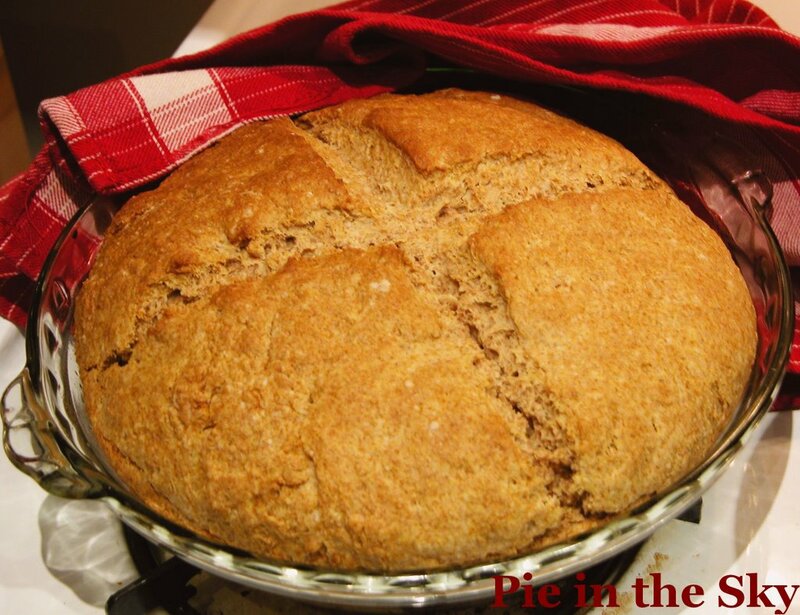 Sift the flour, baking powder, soda and salt together. Rub butter into flour with your hands, mixing thoroughly, until the mixture is coarse and even. Beat the egg in another bowl until very frothy. Beat in honey; beat in buttermilk. Gradually stir egg mixture into flour mixture. Flour hands and finish combining with gentle kneading, pinching seams together. Shape into disc 2-3 inches thick and place in buttered pan. Using a sharp knife, cut a cross ½-inch deep on top of disc. Bake 45 minutes to 1 hour or until the middle is set. Cut in wedges and serve warm from the pan. This bread was hearty, sweet, and completely delicious. We had bought some farm cheddar to have with it, but it ended up being better accompanied by a spread of honey butter. In a small bowl, combine ingredients. Stir with wooden spoon until well blended. 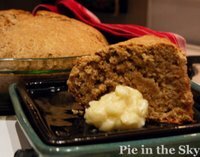 Speaking of butter: there’s a lot of it in this recipe, which gave the bread a crumbly, scone-like texture…and it was great! But for something breadier, you might want to try a recipe with less butter. Memory flashback while making this bread: When I was little, my mom and I made altar bread for the hippie Episcopalian church we attended (which, extremely weirdly, happened to be called St. Patrick’s). We had music on and my parakeet was chirping, and I had a box of butterfly cocoons that were just opening while we made the bread, which was sort of an unleavened version of this Irish Soda Bread recipe, full of whole grains and honey. We cut the crosses on top of the loaves and slid them in the warm oven. Your bread is gorgeous! I bet it was super yummy too. And I'm dying to try the red wine pasta--striking colors. Your photos are lovely. but it was a friend's on loan, i haven't tried it yet myself. yours looks great. happy belated st. patty's day! ...when life gets overwhelming (take it from someone who has done it until the wee hours of the morning)... make bread. There is something about the process. Looks good, I'm trying it.